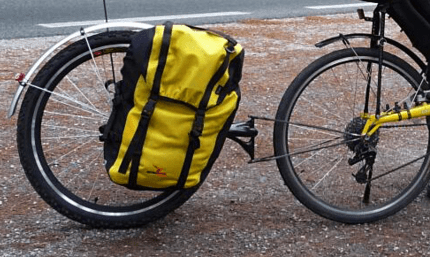 I’ve recently been thinking about buying a trailer to replace some or all of my pannier bags, and I put together a list of pros and cons to help me make up my mind. I just thought I’d share them here to help out anyone else trying to make the same decision. My experience with trailers is limited to two trips on which I used a BOB Yak single-wheel trailer. I used the BOB on a trip across Canada, and for that trip the trailer was amazing. I was camping out most of the time, and the BOB was ideal for that. 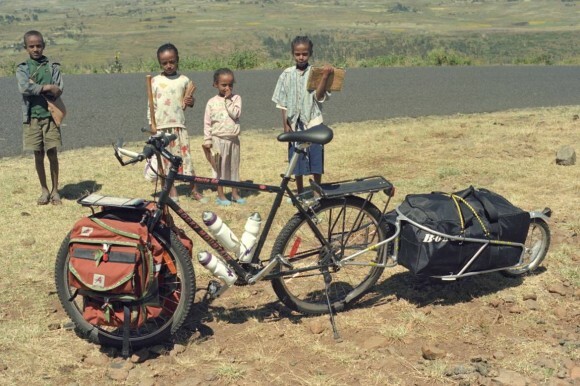 I also used a BOB while cycling through Ethiopia, and on that trip the BOB experience was good in some ways and not so good in others. On all other trips, I’ve used a standard set of 4 pannier bags plus a tent and sleeping bag lashed to the top of the pannier racks. Currently, I’m considering purchasing the Radical Design Cyclone IV Trekking trailer. It’s an expensive piece of equipment, and I would have to order one online without ever seeing one in real life. So I’ve been putting a lot of thought into it. Anyway, here’s the list of pros and cons I came up with. With this list, I was thinking mainly of the standard single- and double-wheel trailers like the BOB Yak (and BOB Ibex), the Burley Nomad, and the Radical Design Cyclone IV. There are lots of other interesting trailers and trailer designs out there, like the Extrawheel, Aevon’s Kit L80, Free Parable’s T2, the Maya and the Carry Freedom among others, but I focused on the single-wheel BOB (the trailer I know best) and the double-wheel Radical Design Cyclone (which I’m considering buying). 1. Takes the weight off the front and rear wheels of the bicycle. This has the huge advantage of avoiding broken spokes and bent rims, and it reduces tire wear. If you aren’t camping or you otherwise carry very little weight, this wouldn’t be an issue for you. But for the average long-distance bike tourer, this is something to consider. And these days, people tend to carry heavier things – eg, laptop computers and large cameras. With all this weight, spokes in the rear wheels are under a lot of stress and can and do break. (At least they do in my case. It has become more and more of a problem for me.) A trailer spreads out the weight and solves that problem neatly. This also means you don’t have to have the world’s most indestructible bicycle with heavy 36-spoke bomb-proof rims and heavy-duty spokes. You can use more ordinary and lighter-weight bicycles and wheels, which are cheaper and more readily available overseas. Pinch flats are also nearly eliminated. 2. Trailer bags accept items of any shape or size or length. Putting a tent with long tent poles or a long sleeping pad on a bike rack presents a problem. They end up sticking way out the back or to the sides. All of these awkward items can fit into a trailer no problem. You can also toss in irregularly shaped or bulky items whenever you like. While crossing Canada with my BOB trailer, I’d often pick up a couple of loaves of bread or a dozen eggs and toss them into the trailer for the night. This was not so easy with pannier bags. Same thing with water. When I got ready for a night of camping, I’d fill up my water bag with ten liters of water and toss it into the trailer. I wouldn’t ride all day with that much water, but for the short ride to my chosen camping site, it was no probem. 3. Packing and unpacking is much faster, more efficient, cleaner, and safer. 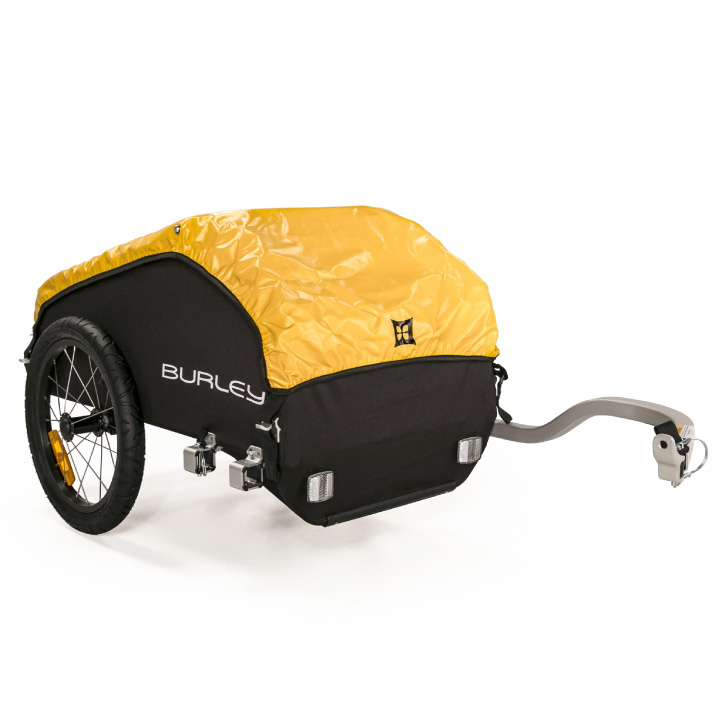 The available volume of the trailer bag is all one in one compartment instead of being divided up over several pannier bags and lots of pockets. So you don’t have to worry about which item will fit best in which pocket or compartment. And you don’t lose available space. The more separate compartments you have, the more available space that goes unused. With a large duffel bag, you tend to use up all of the available space more efficiently. The exact same amount of gear takes up far less space when placed in one large container than when it is in many different containers. It’s also much faster and easier to set up camp. While crossing Canada, I camped out all the time, and it was wonderful to be able to quickly set up the tent and then throw my BOB Yak Sak into the tent and I was done. I didn’t have to fiddle around with bungee cords and unhooking five or six bags with some of them ending up on the ground and getting dirty while I did so. The same thing applied in the morning. I could stay inside the tent in comfort and put all my gear back into the Yak Sak and then toss out that one bag to put in the trailer, and I was done. This was a big advantage particularly when it was raining. Plus, with a trailer you don’t have to worry about all the hooks and metal bits on pannier bags puncturing and tearing the floor of your tent or the sleeping pad. With pannier bags, I’m always making sure the bags are lying on the tent floor with the hooks facing up. With the large duffel bag in the BOB, I didn’t have to worry about that. 4. Saves money on gear. Cyclists end up spending a lot of money on specialized gear that packs down small. For example, they might buy an expensive down sleeping bag instead of a synthetic bag. This saves space, which is very important when using pannier bags. Same thing for tents, sleeping pads, stoves, etc. With a trailer, you don’t have to worry about this. You can use less expensive (and often more durable) gear because you don’t have to worry about packing it down super small. I’m not talking about weight here, but just volume. 5. You can carry a full-sized backpack or daypack. A constant puzzle for bike tourers is how to carry gear when you are OFF the bike. The average pannier bag is a beast to carry around all day when it’s not on the bike. I’ve rigged up a way to transform one of my pannier bags into a backpack. It works, but it is not ideal. With a trailer, it’s simple. The large single-compartment trailer lets you toss in any daypack or backpack you like. When you get to your home for the evening, you unzip the large duffel bag, pull out the daypack conveniently stored at the top and off you go into the city or village or wherever to go exploring. The trailer can easily fit a full-sized backpack,which gives you the best of both worlds. You can go bike touring but then switch to backpacking whenever you like. Using pannier bags overseas presents some security challenges. When packing/unpacking the bike to put it on local boats in the Philippines, for example, or to go into hotels, it’s hard to keep track of all the separate bags. There’s the constant worry that someone can grab one of the bags and run off with it. In fact, unpacking a loaded touring bike by yourself can be quite the logistical challenge. Which bags do you remove first? Remove the wrong one, and the bike becomes unbalanced and topples over. And which bags do you leave unattended on the bike as you make two or three trips into the hotel to carry all the separate bags? Plus there are all of the individual pockets and compartments. I experienced this problem on every trip I’ve taken with pannier bags. A group of twenty children surrounding you is not uncommon when you stop at the side of the road or in a small village or town. Busy and curious little hands inevitably start unzipping pockets and digging around inside searching for things to steal, and it’s impossible to keep an eye on all of them. A trailer bag solves this problem neatly. You only have to worry about one bag. You put a lock on that one zipper, and you’re done. It adds a lot to peace of mind. A fully-loaded touring bicycle with pannier bags can be an unwieldy monster. Mine ends up somewhat top heavy, and when I stop at the side of the road to take a picture or something, it’s hard to straddle the bike and keep it under control. It also takes great care to park a loaded touring bike anywhere and keep it from being bumped and crashing to the ground. A trailer removes these problems. The center of gravity (at least in my case) is much lower with a trailer and straddling the bike is no problem at all. The bike doesn’t want to topple over and the front wheel wheel doesn’t want to twist and spin out from underneath me. 9. Can be used as luggage on airplanes. For this point, I’m thinking mainly of Radical Design’s Cyclone IV trailer. The trailer itself is essentially a giant duffel bag. I’ve never seen one in action, but it appears that in airports, you can simply remove the tow bar and the wheels, put them inside the duffel, and boom, you have a piece of luggage. This is FAR easier than having to deal with 4 pannier bags, a handlebar bag, a tent, and a sleeping bag. I’ve always had to buy two large bags in the local market to put my pannier bags inside. Then after the flight, you have to throw away those bags and buy new ones for the next flight. It’s a huge inconvenience. Other people don’t ever talk about this problem, so perhaps there is a better way to go about it. You only have to worry about making one bag waterproof. The BOB is usually used with one large waterproof bag. The Cyclone IV bag is extremely water resistant, and it comes with a waterproof cover for really wet days. This is much easier than having to worry about waterproofing lots of separate pannier bags (especially if they are bags with lots of compartments and pockets). 11. Simpler and more efficient. With a single large bag and a trailer, you don’t have to mess around with hooking up four separate bags and then untangling a bunch of bungee cords to attach sleeping bags and tents and all the other doodads that we often end up draping from our bikes. You also don’t have to worry about all the hooks and attachment mechanisms on all the pannier bags failing or breaking or getting lost. Also, attaching and detaching a whole bunch of pannier bags and camping gear is a complex process. I’ve often wanted to quickly dump all my gear in the middle of a day of riding and just go off exploring on an unloaded bike. For example, in the Philippines, I would track down the local police station in a small town or a tourism office in a larger town. I’d ask if I could leave my bags there while I go exploring on my bike. They would always say yes. But taking all the bags off and putting them all back on again takes a long time, and sometimes I just couldn’t face it. I’d end up with the mindset of someone unwilling to stop and explore. I’d just want to get to my final destination for the day and then unpack everything just once. With a trailer, it’s far easier to do this. You just unhook the trailer and head off exploring. Then you come back and attach the trailer again. It’s a lot faster and I’m much more likely to make pitstops like this with a trailer, which can make the trip more rewarding. The same idea applies when taking boats or other forms of transportation. There were times in the Philippines, for example, when I’d ride my loaded bike up to a ferry at a dock to buy my ticket or check in. Then I’d have to wait for two hours for the boat to leave. I’d want to ride around the local area while I waited, but I’d rather do it with a light bike with no bags. But I couldn’t really take off all the bags and leave them with the ticket office and then put them all back on again only to ride my bike onto the ferry and have to remove the bags again. With a trailer, I could just unhook the trailer at the dock and go exploring. Simple and easy. 12. Possible to purchase or use local bikes and keep travelling. 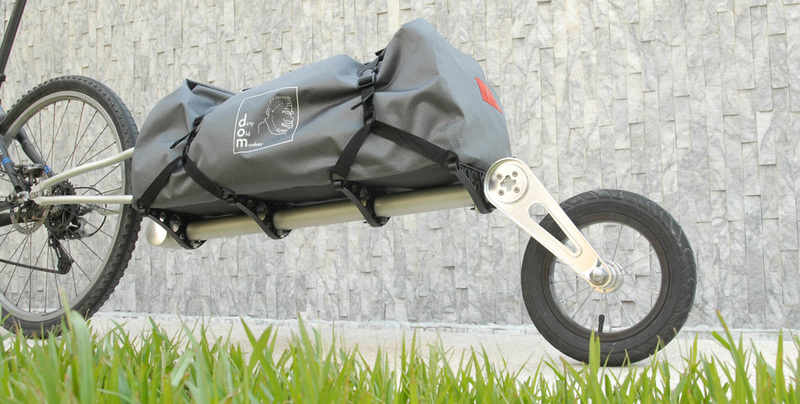 The idea here is that if all of your luggage is inside a trailer duffel bag like the Radical Design Cyclone IV, you can use any bike at all. You don’t need special pannier racks or attachment points. You could fly to a new country with just the trailer and the trailer hitch, buy or even borrow a bike locally, mount the trailer hitch and start riding. When it’s time to leave, you could give away the bike and go to the airport with just your Cyclone IV. This way, you can avoid the hassle of dismantling and boxing up your bicycle. This could also be useful in case of emergencies – if your bicycle is stolen or run over by a truck. You could simply purchase a new bike – any bike – locally, attach the trailer and keep traveling. This would be easier than trying to buy a dedicated touring bike with pannier racks and all the other specialty gear. 13. Provides some protection from aggressive dogs. This is an odd advantage, but I had personal experience of this while using a BOB trailer in Canada. Dogs in rural areas in Canada can be quite territorial, and it’s unnerving to have a big farm dog rush out onto the road and start snapping at your ankles. But I found that with a trailer like the BOB, the dog would chase and snap at at the rear wheel of the trailer rather than at my feet and legs. I assume that this is because it is the last thing on the bike. It’s like how a dog would chase and bite at the rear wheel of a car, but it wouldn’t bite at the front wheel, which makes sense. It’s the same thing with a bicycle, and a dog will instinctively chase the last part of your bike. With a trailer, that last wheel is far away from your legs. This isn’t a reason to buy a trailer and use it over pannier bags, but it is an unintended plus. 1. A trailer makes the bike much longer. This problem became apparent very quickly the first time I used a trailer and then tried to stop at a coffee shop or a convenience store. It’s hard enough parking a fully loaded touring bike. With the added length of a trailer, this becomes much more difficult. It’s also more difficult to navigate sidewalks and narrow hotel lobbies – particularly when you need to turn around. It’s not a dealbreaker by any means, but that long trailer can be awkward. A more serious concern is the risk of the driver of a car not seeing the trailer and turning a bit too close to your bike and hitting the trailer. This can easily happen at an intersection when there is a lot of traffic. The driver of a car might wait for a cyclist to pass before starting their turn. But the trailer is below their field of vision and the driver might not see it and then turn too soon. This never happened to me or even came close to happening while using the BOB, but it was something that I thought about. I tried to alleviate those concerns by using the bright yellow flag available for the trailer. The width of a two-wheel trailer might pose an increased risk of being hit from behind by a vehicle, but I don’t believe this to be true for a good touring trailer. 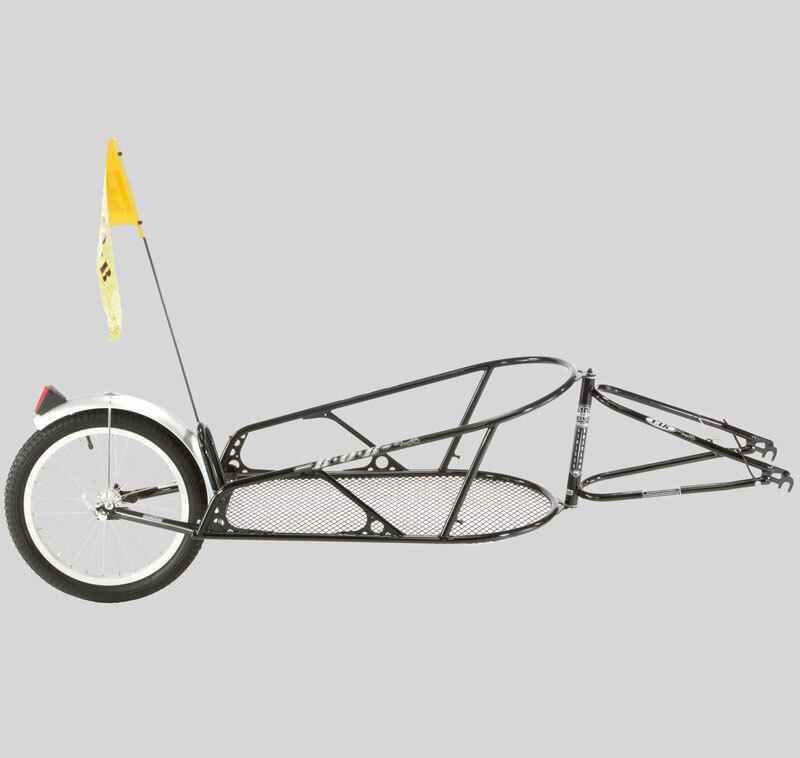 The Radical Design Cyclone IV, for example, is only 26 inches wide (65 cm) at its widest point. That is from the outside tip of one axle to the outside tip of the other axle. That’s roughly the same width as my bike with a pannier rack and rear pannier bags. And it’s actually narrower than my handlebars with the attached mirrors. In addition, anecdotal evidence indicates that car drivers actually give more clearance when driving past a bike with a trailer than a bike with pannier bags. I’ve experienced that myself. When I used pannier bags, cars would cut very close. They try to stay 100% in their lane and cut as close to the bike as possible. But when I used the BOB, car drivers would swing out much wider and go around me. I felt safer using the trailer than I did when using pannier bags. Other cyclists have reported the same experience. The situation could be different for utility trailers. I’ve seen some utility trailers that are considerably wider than the Cyclone IV or the Burley Nomad. People have used them for touring, but I think their extreme width makes them impractical. They’re meant for home and city use to carry large, irregular loads. When people talk about trailers being too wide to be practical, they are probably talking about this type of trailer and not the dedicated touring trailers, and certainly not the single wheel trailers like the BOB. 2. A single bag can become very heavy. Yes, it’s awkward to have to deal with 4 pannier bags plus a handlebar bag plus a tent and a sleeping bag. However, each individual bag is light enough to carry easily. But if you put all that weight into one big bag, it can become very heavy. It’s nice to carry just one bag up four flights of stairs, but when that one bag weighs fifty pounds, it’s no easy feat. The Radical Design IV has that nifty trick of turning into a luggage trolley, but that doesn’t help when you have to go up and down stairs. 3. More difficult to separate items. Having one large bag is convenient in some ways, but it can become inconvenient, too. Small items can become lost every easily. Of course, you can deal with that problem by organzing your gear in lightweight stuff sacks, etc. However, you still end up putting things like soap and cooking fuel and your stove in the same bag as your clothes and food and sensitive electronics. With pannier bags, you can isolate your greasy tools and smelly cooking stove. With a trailer, it’s more difficult. If your fuel bottle leaks inside the trailer bag, it can be a total disaster. 4. Looks and feels a bit dorky. I have to face it. Trailers look dorky. And having that thing behind your bike takes away from the overall feeling of freedom that a nicely loaded touring bike offers. It’s nice to have all your wordly possessions mounted directly on the bike that you’re pedalling. When you have a trailer behind you, it feels more restricting. It’s just not as psychologically appealing as pannier bags. A dude on a touring bike with pannier bags looks like a dude on an adventure. Same dude with a trailer looks like an office worker pulling a tent trailer behind his car after retirement. 5. More wheels to worry about hitting potholes. For this con, I’m thinking mainly about two-wheel trailers. Single-wheel trailers like the BOB aren’t a problem. The wheel of the BOB tracks directly behind the wheels of your bike, so it goes where you go. If you avoid a pothole with your bike, the trailer also avoids that pothole. But with a two-wheel trailer, this isn’t the case. I’ve never used one before, but I can imagine that on rough roads, it’s a pain to have to constantly worry about where the wheels of the trailer are. On my recent trip in the Philippines, it was hard enough trying to avoid giant rocks and coconuts and potholes the size of craters with just my bike. It would have been much more challenging with two more wheels of a trailer, both of which are sticking out to the sides. This was an unexpected problem. I listed as an advantage to trailers that it takes weight off the rear wheel of the bicycle. However, when I was in Ethiopia I discovered that on steep mountain roads with loose gravel or dirt, my rear wheel wouldn’t get enough traction. With all the weight in the trailer, my rear wheel would just spin and not get a grip on the road and be able to pull the trailer. This was only a problem on the steepest of dirt and gravel roads, but it was a very real problem for me on that trip. This loss of traction can also be a problem when trying to brake while going downhill, particularly on loose gravel or stone. There is far less weight on the front wheel when using a trailer, and when you apply the brakes, the trailer keeps pushing you from behind. The front wheel doesn’t grip the road or gravel and it just skids along and there is the risk of losing control of the bicycle or even jacknifing. Personally, I didn’t have that problem, but that may be because I had pannier bags on my front wheel, and they added sufficient weight to give me better braking. I also ride very slowly even when going downhill. I almost never simply release the brakes and race down slopes. However, other people have reported this issue, and it’s something to consider. 7. Public transportation and airports. Some people have reported having no problem using a BOB trailer in airports. They’d just tape down the bag and cover up the forks. In my experience, it’s not that easy and this represents the number one problem with BOB trailers. They are simply too long and unweildy for airports. I don’t think most airlines will even accept them unboxed. And finding a box to fit a BOB is a major challenge. And even if an airline would accept a boxed BOB trailer, the only way to do it is to spin the front forks around, which means you can’t have the sak in place anymore. And it’s sure to be considered FAR oversized. An airline may or may not accept it even as oversized luggage, and then it would cost a lot. I’d love to hear the experiences of BOB users when they tried to fly with them. My hope is that should I purchase a Cyclone IV, it will be very easy to use in airports and on public transportation. For me, this isn’t really a con, but I’ll list it here since so many people bring it up. It’s true that having any type of trailer attached to your bike has an effect on the bike’s handling. When I was going downhill with the BOB trailer, I could sometimes feel the BOB pushing me. It was a weird feeling at first, but I soon got used to it. The point is that the effect on handling is a result of the weight of the gear, not the trailer per se. You have the same weight on the bike using pannier bags, and in my experience, that has a far stronger impact on handling than the same weight in a trailer. So handling is an equal problem between trailers and pannier bags. 9. Trailers tempt you to carry too much. This also isn’t really a con for me. But I’ll list it anyway. The idea here is that it’s a human tendency to take as much gear as our bags can carry. If you have a big backpack, you will fill the backpack to the top. If you have a huge trailer bag, you will fill it. It’s human nature. So it’s better to limit yourself to a set of four pannier bags. Then you won’t be tempted to carry everything plus the kitchen sink. In the end, I don’t think trailers tempt you to carry too much. They just offer a different way to carry that same amount of gear. 10. More tires means more flat tires. I also don’t really think this is a true con. It seems logical that if you have a trailer with two tires, you now have two more tires that can experience a puncture and you’ve doubled the number of punctures you’ll have to deal with. In my experience, this isn’t true. Punctures are a product of the amount of weight you’re carrying, and a trailer spreads that weight out. I think a trailer reduces the number of flat tires you’ll experience (not to mention broken spokes and bent rims). Nearly all of the advantages listed above apply to the BOB trailers. In addition, they are narrow, extremely durable, and well-built. They track directly behind the bicycle, which makes them ideal for off-road riding and narrow roads with lots of traffic. 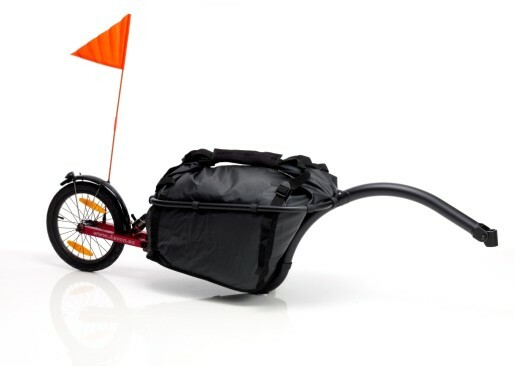 The rigid frame also makes them useful for carrying sharp and dangerous items like a load of firewood or equipment. 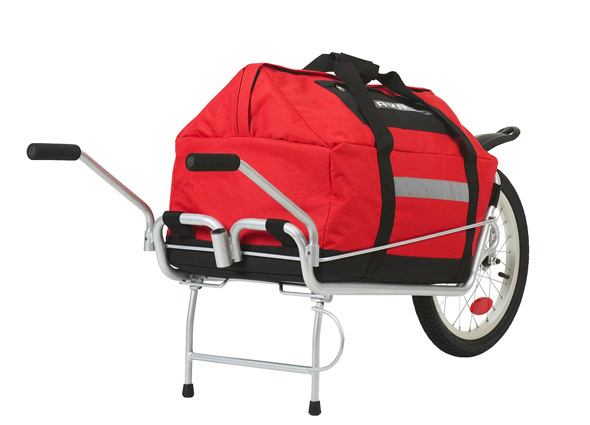 The rigid frame also means you can transport any type of bag. You can use a large dufffel bag or your own backpack. The flat rigid bottom also makes a convenient table top. When camping for the night, you can flip the trailer over and use the rigid bottom as a cooking surface or a desktop. The BOB comes in two basic flavors – the Yak and the Ibex. The main difference is that the Ibex has suspension. That’s good, but it makes it considerably heavier than the Yak. The BOB is quite long and awkward when it comes to airports and buses and trains and hotel rooms and stairs. The trailer frame does not break down or fold up, so you are stuck with dealing with this giant metal frame in addition to the duffel bag. Other people have reported success in getting airlines to accept the BOB trailer as (very oversized) luggage, but that has not been my experience. The thought of trying to get a BOB into and out of airports and airplanes makes me reluctant to use it for international bike tours. Because of the single-wheel design, it’s not very easy to move a BOB around while off the bike. Double-wheel trailers are easier to move around. And it takes a bit more care and effort to attach the BOB and detach it. Note that the trailer has to be empty when you do this. You might be tempted to try to hook up and unhook the BOB while it is loaded, but that would be a HUGE mistake. Chances are that you will get one side of the trailer fork attached and locked in place, and then the other side will come loose and the whole trailer will spin and with all that weight in the trailer the torque will twist the BOB frame and the skewer and even the bike frame like spaghetti. You really must hook it up empty and THEN put in the luggage. And the reverse is true. You must take the luggage bag out BEFORE you unhook the trailer. Trust me. 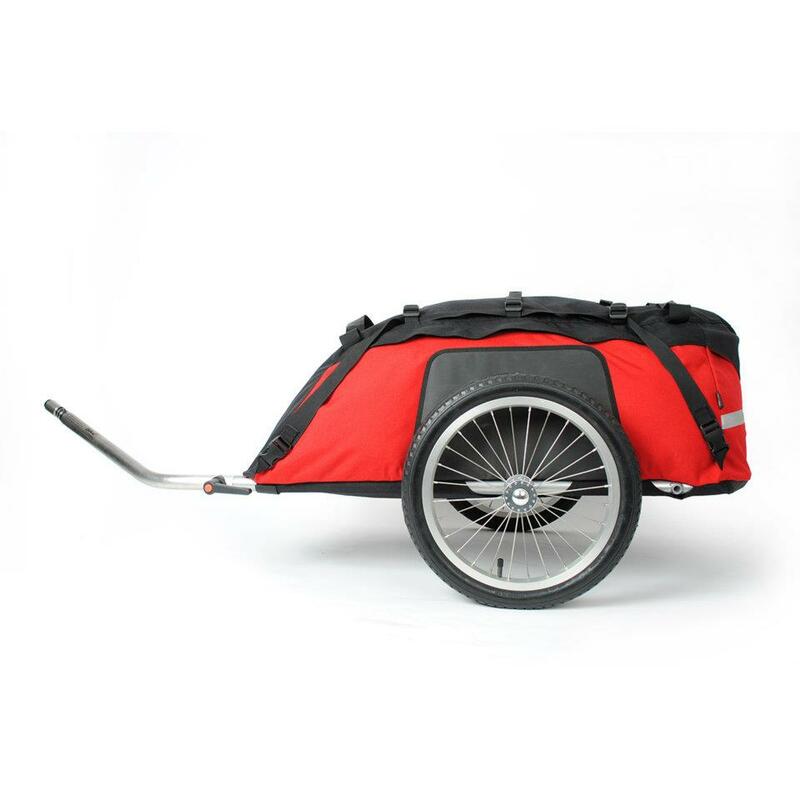 The single wheel design means that it puts more weight on the rear wheel of your bicycle than comparable double-wheel trailers. This also means it can’t stand on its own, and you have to balance it while hooking it up or unhooking it. And when you park the bike, the weight of the trailer has to be taken into account. A two-wheel trailer just sits there on its own. I mentioned in the list of cons for trailers in general that the lack of weight on the bike itself can mean a loss of traction, making it nearly impossible to go up really steep hills on gravel or dirt roads. One way to counteract this is to also put a set of rear pannier bags on the bike. However, this might not be possible depending on the combination of pannier rack and pannier bags. The way the attachment assembly on the BOB is designed, pannier bags may or may not be able to be mounted on the rear wheel. I had Arkel rear bags, and they could not be placed on the back. The BOB attachment assembly interfered with them. As you can see on the picture at the top of this post, I put those pannier bags on the front wheel, which was not ideal. This is the trailer that kickstarted this whole process of thinking once more about bike trailers. I’ve been reluctant to use the BOB for international touring because I feel it would be difficult to get a BOB on airplanes. The Cyclone IV fixes that problem. The BOB is a trailer PLUS a duffel bag. With the Cyclone IV, the duffel bag IS the trailer. It’s all one unit and in theory you can detach the tow arm and the wheels, put them inside the bag, and then hand it over to the airline as one of your checked bags. It is a large bag, but in essence it is no different from any other piece of luggage. That is a HUGE advantage in my opinion – an advantage over the BOB and over pannier bags. I also really like the way that the wheels can be moved to the back of the trailer. This turns the trailer into a luggage trolley. You can unhook the Cyclone, move the wheels to the back and then easily roll your luggage to wherever you want. I can picture many situations where this would be useful – moving into and out of hotels; going shopping in local markets; moving around airports, train stations and bus stations; taking ferries; etc. Another potentially big advantage of the Cyclone IV over a single-wheel trailer like the BOB is that the Cyclone IV can probably be stood on its end upright when loaded with gear. I recently had to struggle with getting my touring bike with pannier bags onto ferry boats in the Philippines. It was hard enough finding room for just the bike. If I had the added length of a trailer, it would have been even more difficult. But from looking at videos and photos online, it seems to me that you could unhook the Cyclone IV and then stand it upright on its end beside the bike. It would take up far less space that way. And you could lock it to your bike frame easily. The Cyclone also seems to be extremely well-designed from every point of view. The trailer hitch appears elegant and very strong. The bag itself is made from strong material with a big, durable zipper which goes the full extent around the top of the bag. The top part of the bag pulls down over the zipper to increase waterproofing, and there are multiple straps for cinching the bag tight. It has a large volume and weight capacity (100 liters and 40 kilograms), and it comes with a shoulder strap and lightweight raincover. I see almost nothing in the overall design and construction that I dislike. A big advantage of a trailer like the Cyclone is the stability afforded by the two wheels. However, this also makes it wider, which is its biggest disadvantage. As a cyclist, I like to hug the edge of the road and stay as far away from dangerous buses and cars as possible. But with a two-wheel trailer like the Cyclone (and the Burley Nomad), you can’t do that. By necessity, you have to stay a certain distance away from the edge of the road. Otherwise, the right wheel of the trailer will drop off the pavement. So you have to constantly monitor where the wheels of the trailer are and ride accordingly. I don’t know how big a problem this would be in practice. It’s just in thinking about it that I see a problem. Another con might be the lack of a solid base. The floor of the trailer is essentially the bottom of the duffel bag itself. I’ve heard reports that if loaded with heavy items, the bottom of the bag can sag down as much as four inches and end up scraping along the ground when you go over bumps or rocks. The solid metal base of the BOB would be preferable, BUT that would add considerably to the weight. It’s a trade-off in the design. My guess is that in the real world, this lack of a solid base wouldn’t be a problem, particularly when your luggage already consists of long and solid items like tent poles and sleeping pads to provide structure and support for the smaller items loaded on top. Of course, you can’t really conclude that a trailer is better or worse than pannier bags. 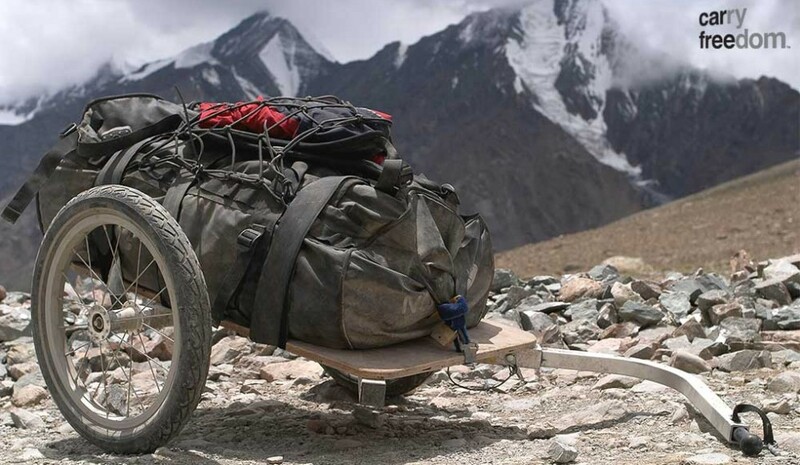 Pannier bags and trailers have their advantages and disadvantages depending on many factors – personal preference, the size and weight of the gear you’re carrying, length of trip, type of trip, destination, budget, etc. I don’t do any off-road riding through mountain trails, so I haven’t even taken that into consideration. If your main interest is actual mountain biking on trails, that would likely change everything. You couldn’t even consider a two-wheeled trailer for that, and you’d likely consider the BOB Ibex or the Extrawheel or one of the Aevon trailers. Both trailers and pannier bags work just fine. For me, the number one concern right now is broken spokes. And I see a trailer as a way to deal with that problem. Thank you, I have a BOB and will be using it to go from Santa Cruz, CA. to Washington, D.C. The reason I will be using it is I own a BOB and the panniers I would like would be $ 700 and I don’t want to spend that much. I will also use my old panniers on the front for balance. This is my first long trip and I have no time restrictions.